Weenies are meant to be played with. This is clearly the message Nathan's Famous Hot Dogs was sending in the 1990s with the release of 5.5-inch, bendable (Gumby-like) toys of their mascots, the Franksters, in kid's meals. Gumby was attempted to be reached for comment but did not return phone calls. If the command that caused Latrell Sprewell to attack P.J. Carlesimo in practice 14 years ago was "Put a little mustard on (it)," then imagine how degrading that would be to say to an actual hot dog. Having never actually tried to communicate with a piece of processed meat, I would imagine they would not enjoy lavishing themselves in a condiment designed to make them more appealing. From my experience handling wieners, they seem resigned to being eaten but would much rather participate in organized sports. Not only does Nathan's provide the bounty for the only eating competition ESPN broadcasts, their mascots, the Franksters, seem unconcerned about being devoured and more intent on having their on-field performance analyzed by Ron Jaworski or Buster Olney. Seeing as how the various Franksters through the years have included a football player, baseball player, basketball player, soccer player, tennis player and hockey player, this would lead one to believe that sports is the preferred pastime of ground meat that has been stuffed into sausage casings. There were even Franksters dressed as a cheerleader, water skier, skateboarder, roller skater, snorkeler and one confused hot dog dressed like the Chiquita Banana girl. And the sports-themed Franksters, generally, weren't dressed in generic uniforms. Rather, they modeled officially-licensed Nathan's jerseys, indicating they were part of a league. 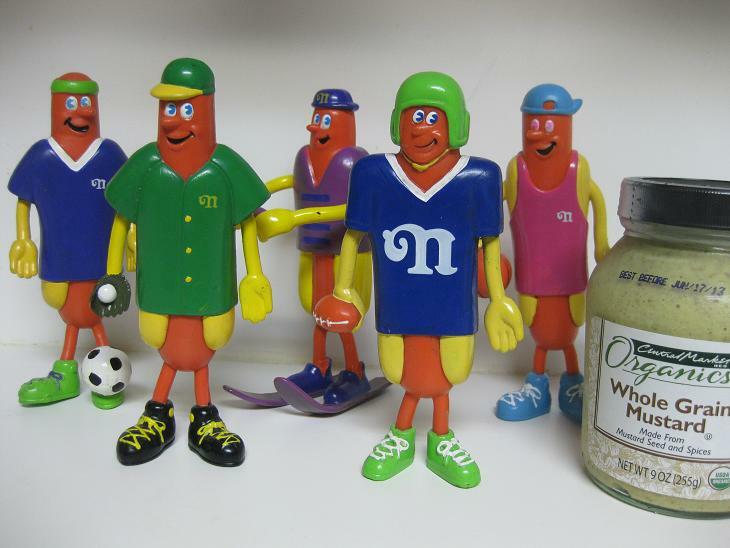 Whether Nathan's was a league unto itself that fielded multiple teams (which Jaworski would refer to each time as "the National Frankster League") or was simply one team of Franksters that competed in a league against other unbeknownst animated food products was unclear. Unfortunately, though I have an astonishing collection of Franksters, I have yet to find an adult-size blue jersey, featuring the large "N" on the front, which would be ideal swag for a Fourth of July cookout, signifying my support for both my team and my lunch. But judging from the smiles on each Frankster's face, they would much rather be compete'n' rather than eaten.